Wellwood Leslie chartered architects have submitted plans for a military barracks and climbing tower on behalf of the Highland Reserves Forces and Cadets Association. Situated on Dalkeith Road, Dundee, The Maritime Reserves Oliver Barracks will offer a range of spaces including lecture rooms, offices, a mess and stores and is designed to accommodate up to 45 soldiers. 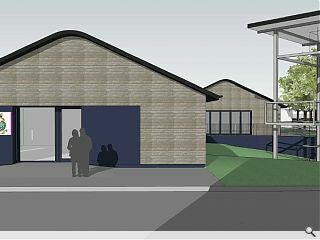 Constructed predominantly from timber the single storey barracks will be faced with untreated Siberian larch and coloured render alongside a galvanised steel climbing tower. In their design statement the architects observed: “The proposed new building would be exceptionally well insulated and have triple glazed windows. “Off-site manufacturing will help to minimise construction waste, and improve construction quality. Windows would be arranged to maximise passive solar gains, and to minimise the risk of glare or overheating in the offices." Oh their chartered .... sure it'll be ok then ?!? No D, no I don't think it will. A timber building to house squaddies? That'll not last long. And "....is designed to 45 soldiers." Not many but what does it mean? Fred, I think the you've got the wrong profession in your sights - journo's can't be blamed for having to work with the amount of rubbish design put out by some members of the august profession of architects.